The Georgia Department of Transportation is proposing that U.S. 441 be widened to three lanes through the center of Bishop rather than build a bypass of the small Oconee County city. GDOT also is proposing that the highway be widened to four lanes from Bishop north to Watkinsville and from Bishop south to Madison following the alignment of the existing roadway. 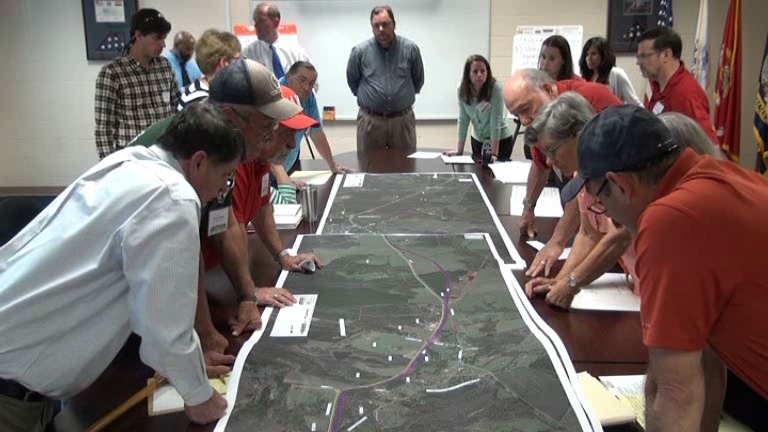 GDOT released the proposed route tonight (Tuesday) at the first meeting of the Oconee County Citizen Advisory Committee, where it met with strong opposition from Bishop Mayor Johnny Pritchett and Farmington resident Buddy Murrow, both members of the Citizen Advisory Committee. Pritchett and Murrow said they want a bypass of Bishop, but Bruce Anderson, GDOT project manager, said no plans for a bypass are being considered at this time. To slow traffic moving through Bishop, consultants to GDOT are proposing two roundabouts, one on each end of the city. The plans also include a pedestrian crossing with a traffic light that is push-button activated. In response to the pedestrian request, a light will turn red, halting traffic. The plans call for streetscaping to make the roadway pedestrian friendly, for landscaping and for pedestrian lighting. The three lanes would stay within the existing right of way in the city and would accommodate traffic moving at its present rate of 45 miles per hour. “If we stay in downtown Bishop, that takes away all of the issues that we heard about,” said Kerrie Boyette, GDOT consultant with KCI Technologies Inc., a Maryland firm with offices in Duluth. By not building the bypass, GDOT would minimize environmental impact, not disturb archeological sites, not damage streams, and not have negative impact on farms, Boyette said. Pritchett hardly let Boyette finish. “And I second that,” said Murrow. At one point, he stood up to leave, but he ended up staying until the end of the 90-minute session. He said he would go over the heads of the GDOT officials, contacting his representatives and calling the governor. The improvements of U.S. 441 are to run from the end of the existing bypass of Watkinsville on the north to the end of the existing Madison bypass in Morgan County on the south. The plans are to follow the existing alignment and use the existing two lanes. The new lanes will be built on either side of the existing roadway as appropriate. To minimize the impact of the roadway, a 24 inch concrete median will be used in place of a 44 inch grass median. The design is for a 55-miles-per-hour speed, the current speed limit on the roadway. Pritchett and Murrow were so dominant at the meeting that it was hard for others to speak, particularly if they wanted to express a different point of view. Lisa Douglas, who was one of the founders of Positively Oconee, a citizen group working to preserve green space, particularly in the south of the county, finally spoke up about an hour into the meeting. “I hope this works,” Douglas said. “I hope it makes Bishop a good place for everyone. “There are a lot of people that will be happy about this idea, about this alignment, all throughout the county,” she added. Claudia Bilotto from consultant WSP Parsons Brinckerhoff, an international engineering services firm with offices in Atlanta, said she expected the next public meeting on the GDOT plans will be in two or three months. She said one possibility is another meeting with the Citizens Advisory Committee, followed by a meeting with the general public. At a meeting last June, GDOT and its consultants said plans for the roadway should be completed in the spring of 2018, with right of way acquisition to begin in the summer of that year. The project is scheduled to be let for construction in the spring of 2021, the officials said at that time. The meeting took place from 5 p.m. to just short of 6:30 p.m. in the Community Center in Veterans Park. It began with introductions of the Citizen Advisory Committee members and a handful of others present. The agenda for the meeting was quite general, and it wasn’t clear that the Committee was going to see actual plans until Boyette began to speak. Boyette focused immediately on Bishop, since most of the controversy regarding the route in the past has centered around possible bypass routes. Boyette started her discussion of the plans at 8:18 in the video of the entire session, which is below. The conversation degenerated into a series of small discussions and then was brought back to order. Douglas made her comments just after 1:01:10 in the video. OCO: US 441 CAC 3 18 17 from Lee Becker on Vimeo. I like the plan to go right through Bishop. There's no need for a by-pass, Pritchett and Morrow to the contrary. But why go to the bother of roundabouts? Just post a speed limit and if it's not observed, put a cop down there. I tend to agree with the mayor. That plan is ludicrous. It in no way solves the problem of too much traffic, especially large truck traffic, in an already crowded area. The town is tight as is with buildings very near the road. If you use the existing road and squeeze in a third lane you remove the roadside parking and make it even tighter. It seems like it would compound problems for the town. If that's the plan why not just leave it as it is? I would also like to hear the plan for decreasing the truck/traffic noise surrounding the 4-way portions. I live on that stretch and the noise level is very high even far off of the road. I was shocked to see that that was all that had been discussed after so much time having been put into the project. For more than 20 years there have been challenges to building a Bishop Bypass. This radically new plan for downtown Bishop is a start to managing traffic issues. It doesn't remove traffic in the obvious way of a bypass, however, its design is to reduce traffic speed and ease turning difficulties in the short but locally significant stretch of 441 between Astondale Road on the south end and High Shoals/186 on the north end. The future may yet include a bypass, for now, some farmers and rural community advocates are cautiously optimistic. Pritchett needs to listen then speak. He's the representative of the town of Bishop. "I want that bypass, this is junk" isn't a very mayoral stance to have. Sounds more like he's bought a house on a busy road and is now disappointed that he didn't get what he wanted. How much land will Murrow sell GDOT if the bypass comes through? Roundabouts?! HUH?! What will game days look like?? Bishop would become a bigger bottleneck than ever! This being a main north-south corridor, how would ANYONE think anything but a bypass around downtown Bishop would ever work, especially as a long-term solution. I don't know of ANY other roundabouts on 441 anywhere in Georgia! Why would these big-city consultants try to do something on a major rural highway that's only appropriate in a city street? Where can the rest of us view these plans? Three lanes and roundabouts? What rocket scientist is making these plans? Let's see if the citizens' input makes any difference at all in the GDOT plans. That might just be the first time ever. Am I reading this correctly, oh my goodness! WOW, that is amazing and refreshing and MOST welcome news! I wrote/commented just a couple of days ago, wondering about this possibility of just improving the corridor. I didn't consider 3-lanes but that is GENIUS and so sensible. I commend the GA DOT. It will not really affect those along the route as it is a noisy, congested corridor right now and will not become noiser. But it WILL become less congested. And it WILL save all that beautiful North GA greenspace, valuable agricultural land and painful displacement that, once it occurs, cannot be reversed. I say BRAVO and I bet lots of good folks will agree! Such very good news. I asked the GDOT team for copies of the maps distributed and was told they were not being released. I did try to zoom on them in the video, but they were flat on the table and the angle was not ideal. I recommend watching the video as the only option at this point. I also support this concept put forth by GA DOT and applaud them for thinking outside the box. I think this plan has the least impact to the Oconee surroundings, which is what I would prefer to see preserved. "Downtown Bishop" --- ??? Where is it? Have I missed something? This is fantastic news for the farmers of south Oconee county. Farm land needs to be preserved if all of us want to eat. Eating is more essential than optimal traffic flow and trade offs are always needed. This will allow Bishop to have a commercial corridor in the center of town. Maybe that proposed restaurant will finally be able to prosper. There are other small towns in north GA that were not bypassed and they are doing fine, better than some that were bypassed. I am very pleased that the GDOT listened to the input from many citizens. If you think this 3-Lane design will reduce traffic and ease congestion, then pass me whatever you're smoking. That fantasy land must be wonderful. The port of Savannah is getting deeper, which means larger ships will come in, which means more trucks will haul freight on 441! Traffic is only going to increase over time, and adding a suicide lane through the middle of Bishop isn't going to help one bit! And have you ever seen a big rig navigate a round about? Lord help the unfortunate Smartcar that gets caught in that situation. Throw on top of the truck traffic : GameDay traffic, commuters that live in the country but work in Athens, and every random tourist passing through Georgia... And you've got a recipe for disaster! If you want to see how this would work, travel about an hour and a half north on 441 to Dillard, GA. The folks in Dillard will tell you a by pass is the way to go. I can see some of the issues about NOT having the bypass such as the driveway right-of-ways and loosing land on the front of your lots as well as the continued truck traffic. SOME of this is just the fate of living in that location in a growing community....look at all the homeowners along Mars Hill! It's awful! BUT......this is proposal is INSTEAD of cutting through family farms in multiple locations, INSTEAD of ruining Greenbriar Creek, INSTEAD of swinging traffic all the way over to Colham Ferry and severely negatively impacting those homeowners who did NOT choose to own property on a major route, INSTEAD of turning the surrounding Bishop area into the destiny of Epps Bridge district within 20 years (which goes by soooo quickly!) There will have to be compromise somewhere. Perhaps there is another alternative that we citizens of the area can propose, but any way you look at it, someone is going to be dissatisfied. It seems to me the path of least resistance is the path of current route and the people who have for years now been living along that corridor and chose to do so had to know this could be the outcome. Not that I'm not sympathetic...I am....I wish it could still be old timey country roads, I detest all this growth...too many people....but it's the world we live in. I was not at the meeting and didn't watch the video yet with my sketchy internet signal, but from the reading of the above I'm perplexed as to why Pritchett and Murrow are so adamant about the bypass unless it's about their profit margins as someone else mentioned above (no offense fella's...don't know either of you) I also can't see the roundabouts working with trucks. I hate the ones on St. Simons Island and another comment above is right...game day traffic would be a nightmare with those. I wonder, too, if the trucking route can't be adjusted to shoot them on down hwy 20 to another existing outlet that will put them on 316 or 78 to get to their Athens and Watkinsville destinations. A "truck route" if you will. Then that puts the burden on Hwy 53 leading them into Oconee...but perhaps that's an easier route to expand width and navigate than a tiny town like Bishop. I know nearby towns like Monticello and Sparta have this same issue, and the bypass around Madison is lovely to travel but doesn't impact many homes as the previous Bishop Bypass proposal did. Let's hope we can work together to make the best of the situation. GDOT officials said at the meeting that the roadway through Bishop would use the existing right of way, i.e., not take additional property. Watkinsville has a bypass. How has that worked out for removing noise, trucks, congestion, etc. from downtown Watkinsville? Due to a bridge collapse on I-85 in Atlanta, a lot of traffic will be diverted onto 441. In an effort to avoid Atlanta, a lot of big rigs and tourist cars will travel through Bishop for at least one month until the highway is repaired. Mr. Mayor, if I were you, I'd sit in front of city hall with a handheld clicker and count the number of rigs and cars that pass through Bishop. Hopefully GDOT will put out a traffic counter in Bishop, but if they don't, you'll want to have some traffic counts on the books. 441's traffic flow over the next month will give us a 15-year vision into the future, and it will be an excellent opportunity to see how an unobstructed road handles large amounts of traffic... As well as imagine what two roundabouts and a center turning lane will do to traffic to a Bishop. I for one support the new DOT plan. It seems ridiculous to me that millions of dollars be spent to bypass an area less than one mile long. Widen the current road if needed. On one side there are only a few old, dilapidated buildings that look like they could crumble at any moment anyhow. In any case, having the Mayor sit outside and count cars because of a temporary issue that may or may not increase truck traffic sounds ridiculous. The DOT proposal is a good one. A traffic light that activates only when cars approach Hwy. 441 from the side streets would solve the problem of residents being able to access Hwy. 441 and would allow the continued free flow of traffic thru town as it is now. Strict speed enforcement and the activation of the traffic light would slow down traffic in the town limits to protect citizens. There is definitely going to be more traffic thru Bishop as the county and the country grow regardless of what GDOT's decision is. Unfortunately Oconee is not the slower paced rural county that we moved into 40 years ago and there is no way to go back. The best we can hope for is to slow down the speed of change. @ Anonymous 7:37am - Those "dilapidated buildings" are someone's property and livelihood, just as valuable as the farm land others want to protect and preserve. Several antique stores have set up shop in those buildings, and Bishop is fast becoming know for its antique scene. How dare you flippantly suggest they could be done away with. Shame on you! I didn't mean to offend. Clearly, the solution is a good one because there are no plans to tear down any older buildings or transect farmlands and the roundabouts will slow down traffic and the town will be more pedestrian friendly for the shops. It seems like a win/win for everyone. I want to thank you for the hundreds of hours you have spent to provide this information for the citizens of Oconee. My work hours do not allow me to attend the evening meetings but through your excellent coverage, I am able to stay informed.